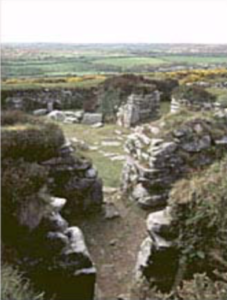 The courtyard house settlement is particular to West Penwith, and typically consists of several large houses, workshops, stables, byres and stores built around a central courtyard area, which may or may not have been unroofed. A paved entrance path often turned away from the prevailing southwesterly winds leads into the courtyard area. 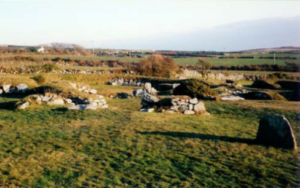 Some of the structures contain round houses, other houses are oval, and all have features of a long room, stone lined and capped drains, and stone hearths. Some have fogous integrated into their design. The exterior walls were typically massive and as high as 7 or 8 feet. Courtyard houses date from the 1st century BCE, and were gradually abandoned during the 2nd and 6th centuries CE.